The Adventure has started! 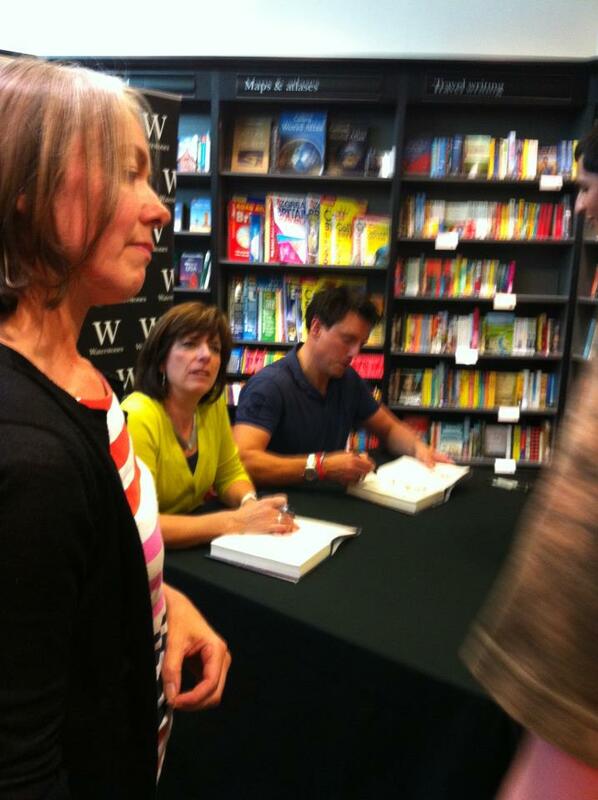 A few days ago, Husband had noticed that John Barrowman was going to be signing copies of the new Torchwood tie-in book with his sister, the author Carole Barrowman, in a large bookshop chain in the centre of Glasgow. I thought John was fantastic in everything I saw him in and since his character had travelled with The Doctor across space and time, I was keen to cross Number 21 – Meet a Time Traveller off the list. In my naivety of how book signings work nowadays, I had phoned the bookshop to get some more details. It turns out that last time the lovely Mr Barrowman had taken part in a signing in the same shop they had sold out of books and the queue was round the block. So, to ensure that I got a place in the line for the signing at 6pm I turned up at 4.30pm. Twitter had me worried as there were many tweets from people already in the queue and I didn’t want to miss my chance. The man behind the counter sighed heavily and rolled his eyes, obviously having been asked this many times already today. ‘Third floor’ he said not even looking at me. ‘Is it quite busy or should I come back?’ This stopped him in his tracks and he looked at me with a gaze that implied that I was the village idiot. ‘Are you kidding?’ I shook my head to inform him that no, I was in fact, not kidding. I don’t know what to do, should I roll my eyes to agree with him? Do I want to align myself with the frustrated yet grumpy bookseller or the strange man who is camped out upstairs? Picking up one of the books that John Barrowman is here to promote, I do a quick scan of the sales floor and realise that this is the only till open. ‘Could I buy this book please?’ offering it to my grumpy friend much like a sacrificial lamb. This only earns me a withering look from behind the counter and he takes the book from my hand. Handing me back my now paid for book and receipt he gives a world-weary sigh and breathes ‘Yeah’. I feel like I should apologise for inconveniencing him from his clearly stressful job. This guy obviously has the weight of the literary world on his shoulders. Instead I just say thanks and move away as quickly as I can. As I head towards the stairs I hear a female voice behind me say ‘Excuse me, where is the John Barrowman signing?’ followed by a loud sigh…. A few minutes later as I arrive on the third floor in dire need of oxygen, I realise that coming along at 4.30pm was quite a good idea. The queue for the signing has snaked all the way around the top floor and I follow it round until I get to the end (next to the World Politics section). Here I plonk myself down next to the last people in the queue and start flicking through my newly purchased hardback. The chatter coming from all around me makes me realise that I’m in the party corner. The is lots of chat, mostly coming from an American couple who have obviously met JB on numerous occasions and count him amongst their close friends. As signing time approaches, every time anyone walks into, by or even looks at the signing area, the assembled crowd watch under their eyelids in case it’s Mr Barrowman. Usually, it’s just a member of staff wandering past or a confused looking book browser who is simply looking for the new Dan Brown and seems to have fallen into some kind of cult meeting on the top floor of their local bookshop. Suddenly a cheer comes up by the front of the queue and like a flash everyone who was previously cross-legged on the floor (myself included) are on their feet. ‘It’s definitely him, I’d know the top of his head anywhere’. This from the American couple who have obviously studied the top of his head at length during their many meetings. The next thing we hear is a loud laugh that could only belong to the man himself and the excitement in the queue grows. Grown women clutch each other’s hand and squeal like teenagers, such is the allure of a handsome sci-fi icon. The queue begins to shuffle forward, books in one hand and cameras in the other and within ten minutes I am fourth in line. ‘Excuse me, are we allowed to take photos?’ someone from a few spaces behind me pipes up. The rest of the people in the queue turn, wide-eyed like a group of owls, towards the security guards waiting for the answer. ‘No posed photos today, the queue is too long.’ Comes the gruff reply. No photos? But my list is very specific. Number 21. Meet (and get a photo as evidence) as many of the following as possible (a Time Traveller). If I don’t get a photo with him, does it count as a tick? After waiting in this queue, am I going to fail at my very first attempt to cross something off? There is a general mutter of disapproval behind me regarding the no photo policy but I don’t get the chance to join in as I am nudged to the front of the queue. She then passes the book on to John and I move over to the other side of the table. ‘Hey, thanks for coming along today.’ He is exactly as he looks on TV, handsome with his dark hair and chiselled jawbone. He is in a cheerful mood and being around all these Scots means that his Scottish accent is seeping through his American one. My grin gets wider and I have enough time to say thank you as he passes my book back and I am ushered away from the table. 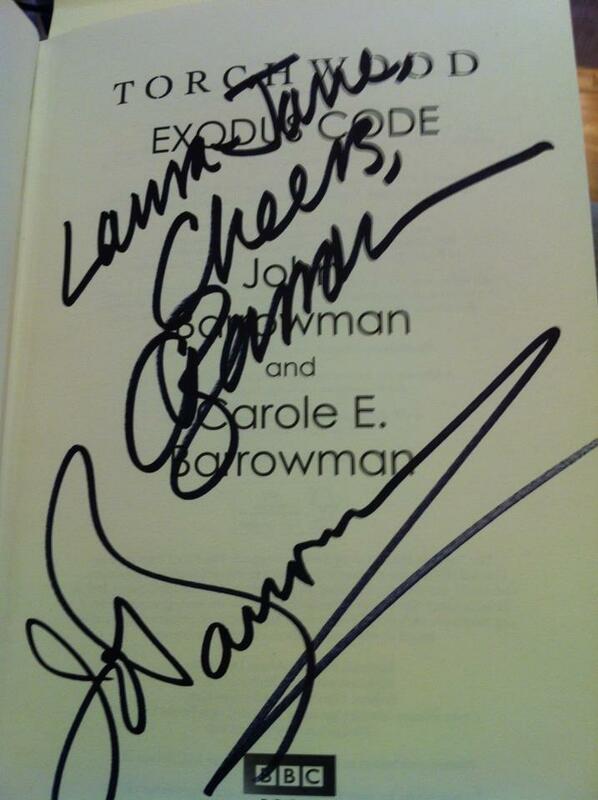 Inside it is my name and two signatures. I did it! I met a time traveller! It may have only been for 20 seconds but I still did it. To some people, it may have only been a couple of scribbles in a book but to me it signals the start of something. It’s the start of My Big Geek Adventure. The start of a year of trying to make things happen instead of moaning about the fact that nothing ever does or daydreaming about what life could be. These two signatures are important. I made that happen. Ordinarily I would have seen the advert for the signing and would have either (a) not been able to go as I’d been too busy or (b) talked myself out of going for whatever reason. Today was a big step and signalled the beginning of something. This is an excerpt from ‘My Big Geek Adventure’ available to purchase on Kindle. Oh wow! Thanks Lesley, I really appreciate that. Thanks for taking the time to read my posts. Trust me, there’s a lot more to come. Have a great day!